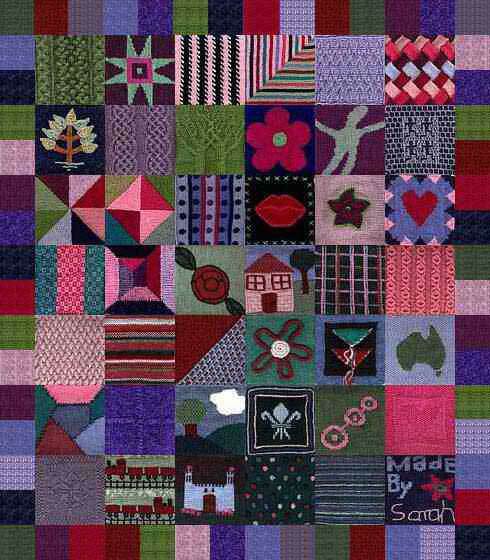 This image is a mock-up of how the finished afghan will look. Step 1: Lay all your squares on the floor in a random order, 6 squares wide and 7 squares high. Keep picking them up and re-arranging them until you are happy with the way they look. Step 2: Draw a large grid and write down the order in which you want to sew your squares together. Step 3: Sew your squares together in rows, following your diagram. I prefer to use mattress st, but since many of the squares have a different number of sts you may prefer a different method. Step 4: Join your rows of squares together using the same technique. Step 5: Lay the afghan centre out flat and pin the border to it. Attach the border to the centre using a neat st.